On 2 June, ISIS fighters attacked a police station in al-Qanan, 10km south-east of Ajdabiya, killing a civilian and injuring another five. No police were injured or killed despite two police cars being set aflame. The casualties were allegedly a family in a car passing by the raid. A go-pro camera recovered at the scene by the Libyan National Army’s (LNA) 21 Infantry Brigade has shown that the raid involved 8-9 fighters. On 5 June, the Libyan National Army (LNA) spokesperson Ahmed al-Mismari announced that LNA forces had taken control of 75 percent of Derna from the DPF. The day before In a video announcement to the LNA and civilians in Derna, Haftar highlighted to his troops the importance of protecting prisoners of war and warned of the dangers to civilians of Derna in aiding and abetting ‘terrorists”. On 31 May, an agreement to secure and control Libya’s southern border was signed by Libya, Niger, Sudan, and Chad in the latter’s capital of N’Djamena. The details of how the agreement will be enacted and how this burden will be shared remains unclear. 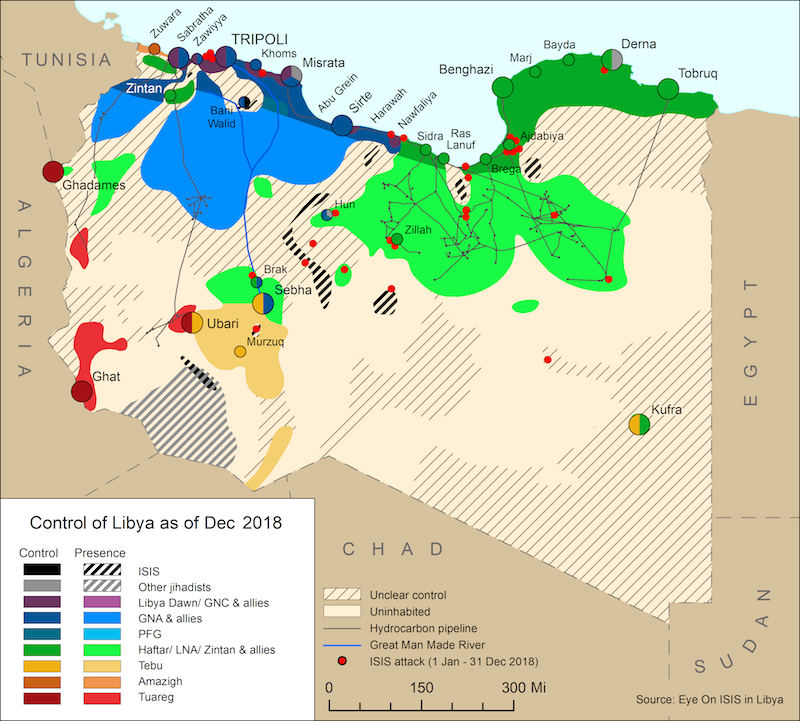 On 31 May, an armed group reportedly composed of Tebu and members of the defunct Benghazi Defence Brigades attacked Teminhint airbase controlled by the Libyan National Army (LNA). 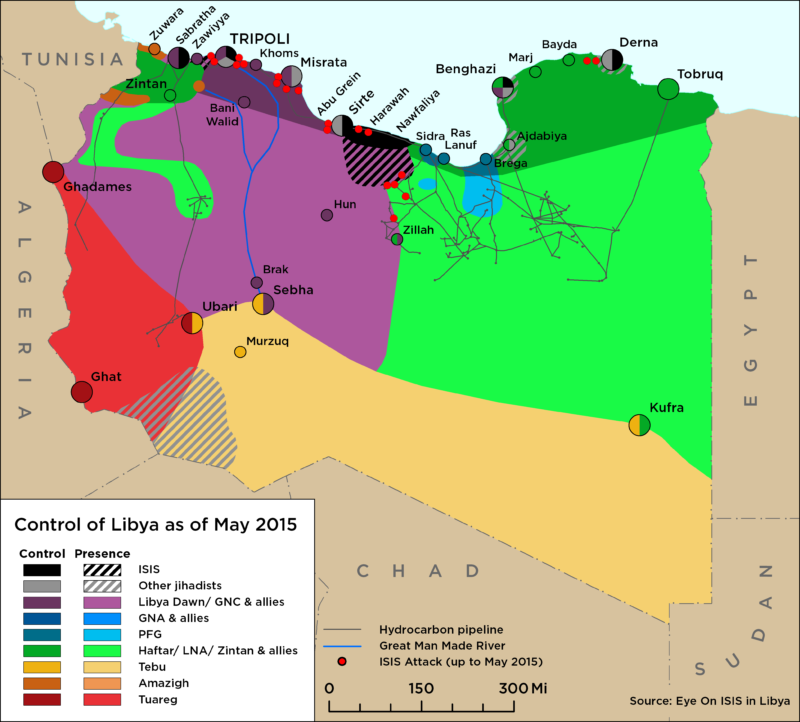 Reports indicate that the LNA’s 116th Battalion repelled the attack after three hours of fighting. On 3 June, delegates from Misrata and Tawergha signed a reconciliation and return agreement that will see as many as 40,000 Tawerghan internally displaced persons (IDP) return to their homes.